This is the beginning. Finally finished the first iteration of my space/gravity game Orbital Traversal and I'm super excited to move on to something else for a while. These simple goals have largely been accomplished this weekend. I wrote some simple scripts which allow the user to instantiate block objects and attach them on any face to other block object. These blocks are then all tied together using Unity fixed hinges. Next I wrote an algorithm that reads the surface vertices of some water object and offsets them according to a simple sin wave along with some noise to create some basic wave physics. The only challenging aspect was real time reporting of the water height so that the block objects could read this height and calculate the buoyancy force. These basic elements are shown in the gif below (anyone know how to embed large gifs?). Add propulsion elements - some sort of motor to start with. Edit UI so that objects can be rotated. Here is a wireframe demo of how the wave/object buoyancy interaction works. 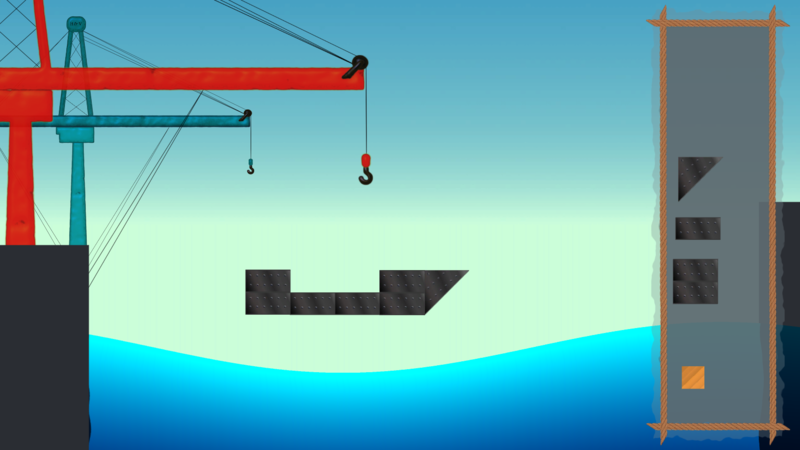 The water reports the surface vertices and a buoyancy script attached to each block finds the nearest water vertex and uses it's height to calculate a buoyancy force. The water itself is just a 42 vertex plane (no collider) whose vertices are edited each frame to give the wave effect. The force added is simply proportional to the difference between the water vertex closest to the object and the object transform. I initially wanted to move away from physics and just add some additional part components but I'm now working on some code which builds information about the boat after its constructed that could inform even more realistic buoyancy calculations and further down the road allow the boat to take on water. The first step is to construct a mesh that represents the boats hull and will inform for example how much empty space in the boat is displacing water (which should be contributing more buoyancy). Additionally, I want to know much space is there for water to fill the boat. :] Sounds really good. With physics I imagine a storm would look very cool. Huge waves and the boat crashing down into the water. I got my interactive water code to work in 2D, now my boats will have a wake!! I've made several small updates, the big ones required a significant amount of 'dark work'. (1) A custom water shader which feels like a big upgrade coming from a standard blue shader with alpha. The shader distorts textures behind it according to a noise map and also creates a nice blue/green color gradient. (2) I've added a simple propulsion method with a mediocre model/animation, I plan to upgrade all the models as I'll be shifting to art soon. (3) A realistic drag model (air and water) which takes into account the rendered water surface height, angle of the objects surface to the water and the relative velocity. Drag is calculated in all directions. The result of these 3 elements can be seen in the gif below. I've noticed that the addition of the drag physics really forces you to create actual boat shaped hulls. Before when I was testing, some pretty silly designs were super effective. A quick look at some of the new art! Please let me know if you have any opinions as I'm not much of an artist and I rely heavily on feedback. I like it because it is so clean. I think the water could be a bit more green now that things look more realistic. Also the boarder of the UI on the right could be better (imo). I like that it's a rope but I'd put knots or loops in the corners. Pier could use more details like green alge or sth but I'm guessing you haven't gotten to that yet.